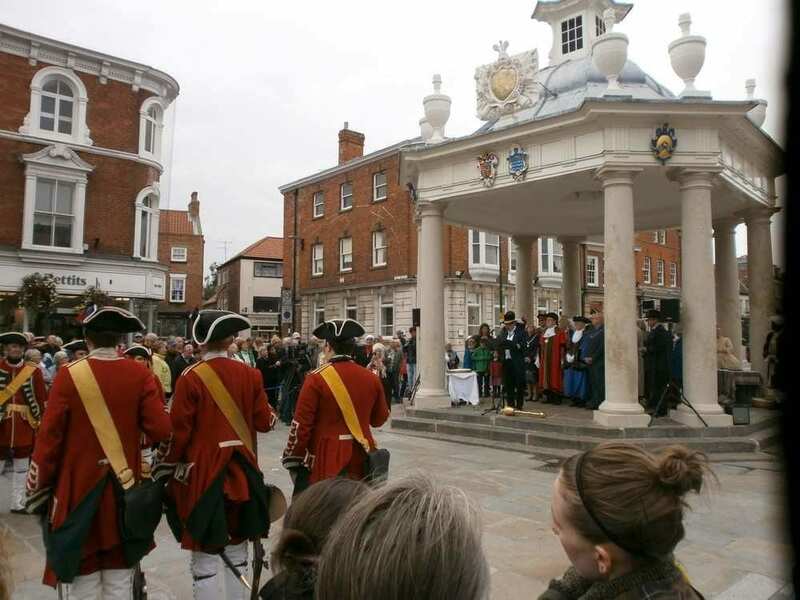 It was fitfully sunny when we gathered at the 1714 structure to protect people selling butter – hence ‘butter cross’ – on the day King George I’s 1714 declaration was read out to the populace gathered in Saturday Market Place (Beverley also has a Wednesday Market Place which still welcomes a market on that day, though the number of stalls has diminished owing to the extortionate rents). We thought we could amble there from the Minster end of Beverley and still find a place in the front row. How wrong we were! 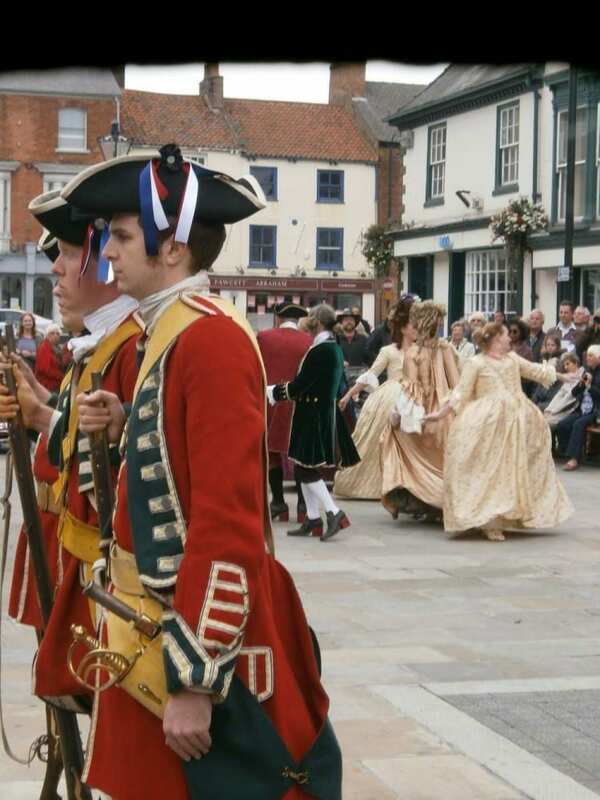 A crowd had already gathered with lots of children and the dancers from the Georgian banquet in the Minster had started a quadrille – or some other Georgian dance, with gliding movements and much dignity – in their wigs, gaiters and crinolines. 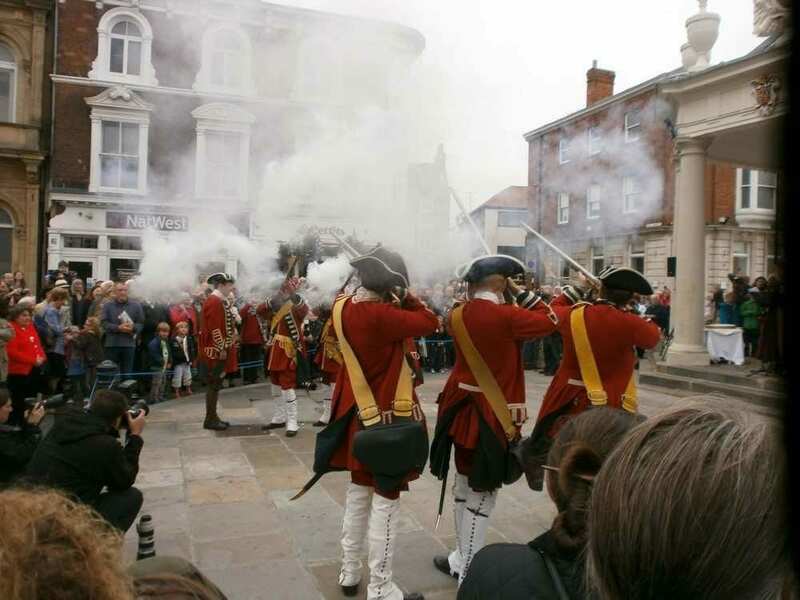 Eight soldiers in red uniforms with muskets stood, four on either side, in front of the Market Cross where dignitaries, most in costume from the Georgian banquet but without the masks, were waiting. Then the current mayor of Beverley read the proclamation, and when he came to a legal point, there was much use of ‘etcetera, etcetera, etcetera’ which I found amusing. The crowd in 1714 must have shuffled their feet more from boredom than cold. the barrels… or was it my imagination? Then everyone in costume was given a basket with chunks of cake, over a thousand pieces. I had two and the Georgian recipe was delicious, all butter and honey and raisins! Then the ceremony was over, George I was on his throne and there was no riot, just everyone wandering off to Sunday lunch.